This is a view of some of the houses in the Tamarindo Preserve development. The Tamarindo Preserve is an ambitious project that came on the market at the wrong time. Some houses have been built, the market is now improving. There is only one beachfront lot left. It was originally price at about one million dollars, but has been reduced. Lots across the street from the beach are only a couple hundred thousand. I have no idea what it costs to build a house. Today is Sunday, so we have new photos posted on our Viva la Voyage travel photo site. This week we are showing photos of a night at the Opera in Paris. We unfortunately went to the wrong Opera House. This is the entrance to the Tamarindo Preserve development, located at the point that is the dividing spot between Tamarindo and Langosta. There are houses and condos on a hillside next to the ocean. were often the source of funds to purchase vacation property in Tamarindo. Tomorrow I will show more of this housing development, and discuss the price of lots. This week we have photos of Blarney Castle, Ireland, posted on our Viva la Voyage travel photo site. It looks like the paddle boarder on the right was celebrating the moment. Maybe it was the beauty of the sunset. Maybe they had just learned how to paddle board. Maybe it was just the end of yet another glorious day in paradise. I haven't posted any butterfly photos recently, so I will share this photo todayn b. We always have butterflies floating around the flowers in the bushes that surround our Langosta Beach condo. People who are considering renting one of our two condos often ask what the weather is like during what locals refer to as the Green Season, which is April through October. I usually visit during the Green Season because our condos are almost always rented during the High Season, so almost all the photos that you seen on my website were taken during the Green Season. This is a typical morning view from our Langosta condo. The days start out with blue skies and white puffy clouds on the horizon. In the afternoon the clouds will move in and there might be a brief tropical shower, then the weather clears and the clouds highlight the sunsets. There can be rainy days during September and October. It is warmer in the December - April dry season, and locals call that summer, even though Costa Rica is in the northern hemisphere, of course, were summer is normally June - August. This is a somewhat unusual collection of rocks along Langosta Beach. At low tide when the water retreats from the sandy part of the beach, there is usually black volcanic rock exposed, such as what you see in the distance of this photo. In this spot, however, there are rocks that appears to be sandstone, and some of them are covered with moss. This is the front door to one of the beachfront mansions along Langosta Beach. Most of the houses have names, and some of them are available for rental. People sometimes will rent the house for groups attending a destination wedding, which has become a more popular trend among young people. One of my sons had a destination wedding in the Caribbean in the middle of a cruise. It was a good solution, as his wife and her family (and my son) live in Argentina, and our family is in the Arizona. We all met in Florida for the cruise. My son wanted to have his honeymoon in Tamarindo, but both of my condos were already rented long in advance for his time period. My other son planned further in advance and was able to honeymoon in our Langosta condo last holiday season. This concludes my series of photos on the little puppy who was playing on Tamarindo beach, the befriended a group who were pleased to dry him off and clean him up. I don't know if the puppy belonged to them, but he seemed quite content. I will give a shout-out to my brother today on his birthday, and express my condolences for the recent loss of their beloved dog after a long life. Their Westie lost the use of his back legs, which required my brother and his wife to carry the dog from room to room, up and down stairs, and outside to do its business, which is tough in the Minnesota snow for a dog that cannot walk. The dog's health deteriorated to the point where the humane thing to do was to put the dog to sleep, but that is a difficult decision even when it is clearly the right thing to do. My brother is a clinical psychologist for the Veterans Administration, so he does important and worthwhile work helping veterans cope with the challenges that result from their service. Today is Sunday, so we have new photos posted on our Viva la Voyage travel photo site. This week we are posting photos of Blarney Castle, Ireland. It looks like the puppy welcomed the attention of people helping to dry off and clean up the puppy from being wet and sandy due to frolicking in the water. This week we have photos of Trinity College, Dublin, Ireland, posted on our Viva la Voyage travel photo site. After watching the puppy running around in the water, the people decided to help the puppy dry off. The arm that you see in this photo has a bracelet that identifies the person as someone who is staying at the Tamarindo Diria Resort and is entitled to use the Resort amenities. I don't know how someone on vacation staying at a beach front resort ends up caring for a puppy. The puppy apparently believed that anything on the beach was a toy for him to play with. He ran off with some sandals for a moment. The puppy seemed to have decided that if he and the woman were going to be friends, she should pay more attention to him, so he nuzzled against her legs and drew the desired attention. The puppy seemed to think that this woman would be a good choice for a friend. Tomorrow we will see the puppy's next move. It should not be a surprise that the puppy attracted the attention of a girl who was part of the group at the beach. It should also not be a surprise that the puppy returned the attention. A group of people was enjoying Tamarindo beach, and a little puppy seemed to want to join in the fun. I will show the sequence of events during the next few days. Today is Sunday, so we have new photos posted on our Viva la Voyage travel photo site. This week we are showing photos of Trinity College, Dublin, Ireland. The girls who I showed yesterday were playing with sand toys on the sidewalk rather than on the nearby beach because, I assume, their parents are one of the shopkeepers on the beachfront street. The children play while the parents tend the shop. These young girls were playing on the side of the sidewalk in central Tamarindo. They are playing with beach toys and sand. The beach is across the street. Tomorrow I will show why they were on the sidewalk instead of the beach. When I refer to "downtown" Tamarindo, I mean the old section of town that leads to the traffic circle at the end of the beachfront road. It is an area about one or two blocks long, with older shops and restaurants. This is a display of Chorotega pottery at a store in "downtown" Tamarindo. It is a store and studio where you can receive lessons and assistance on how to make pottery and then make your own pottery. I have shown the gallery and store in the past, which you can see under the "Chorotega pottery" index label in the right margin. I am sure these pots were made by the instructors and not by the students. Chorotega pottery is a tradition that dates back to pre-Columbian times, and is one of the few Native American traditions that survive in Costa Rica today. I use this photo to engage in some self criticism because this illustrates a shortcoming of my photography skills. I sometimes overlook the principle of "separation" in composition. If there are multiple objects in a photo, there should be separation between them to make it clear where one object ends and the next one starts. They should not overlap or partially conceal each other. There are two separation problems with this composition. The two surfers on the left overlap each other. Even worse, the figure who is the second from the right appears to have three legs, as a second person is obscured behind her, except for one of her legs. I am kicking myself with regret over this composition problem because I returned from Ireland a week ago, and as I go through my photos I am so sorry that I did not have the boldness to move slightly a candlestick on a fireplace mantle in a farmhouse that I photographed. After all, I was a guest. The candlestick partially covered up an old family photo, next to medals awarded to the farmer's grandfather in the struggle for Irish independence. I did not maintain separation between the candlestick and the old family photo. Thank you for indulging me in this therapy. A moment after I took yesterday's photo, the beginning surfer did end his ride in a rather awkward style. He still looked like he was enjoying his surfing, and the people to his right look like they were enjoying watching him as well. This is a rather goofy photo. Someone made a little bird out of the straw of a palm frond. Art is where you find it, or can create it. Today is Sunday, so we have new photos posted on our Viva la Voyage travel photo site. This week we are showing photos of Lake Nicaragua, just north of Costa Rica. 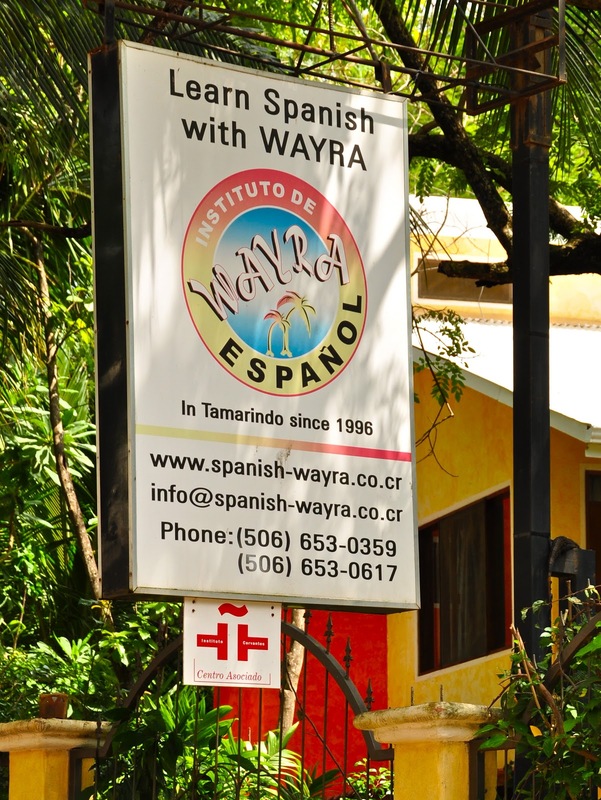 This is the sign for the WAYRA school that offers Spanish immersion classes in Tamarindo. The website and email address are on the sign, and here is a link to the website. I think they offer new classes beginning every Monday, so people who are on vacation for a week can also make progress in learning or improving their Spanish. Their website is in either English or German, and they mention that their staff also speaks French. I need to do this myself when my work schedule gives me the time. This week we have photos of the Cathedral of Milan, Italy, posted on our Viva la Voyage travel photo site. This photo concludes my little series of the Spanish immersion school in Tamarindo. While we are on the subject of education, I will give a brief report on a subject of great interest to the ex-pats who live in the Tamarindo area. 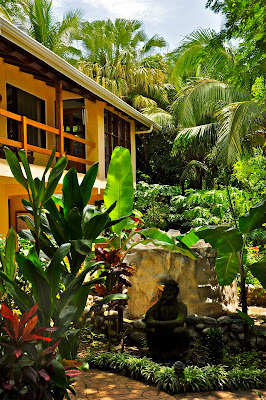 For many years the Costa Rican Country Day School, based in San Jose, has operated an English language college preparatory school just a few miles from Tamarindo, in Brasilito. 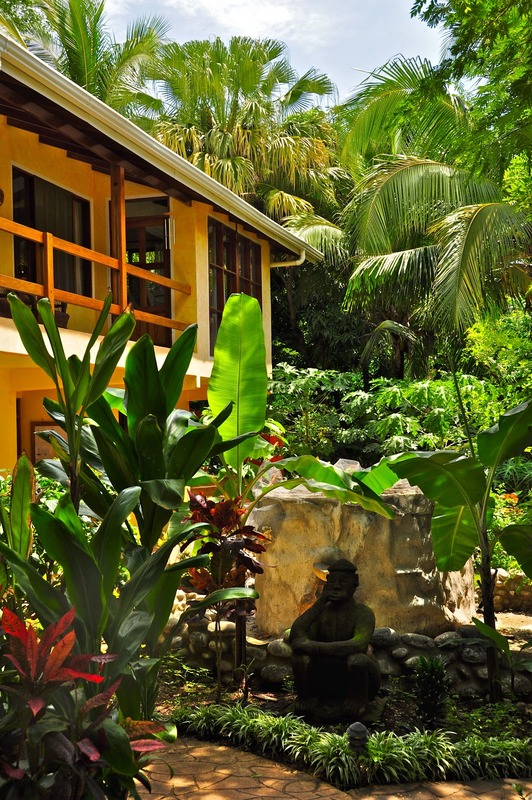 Most of the residents of Tamarindo are foreigners, and many of them send their children to the Country Day School. The Country Day School is a for-profit business and it recently announced that it was withdrawing from the school near Tamarindo because it was not making enough money from that school. Fortunately, they are cooperating with a new community based Board of Directors that will keep the same teachers and will operate the school as a non-profit. Many people think that the school will actually improve despite the loss of the administrative support of the school in San Jose. 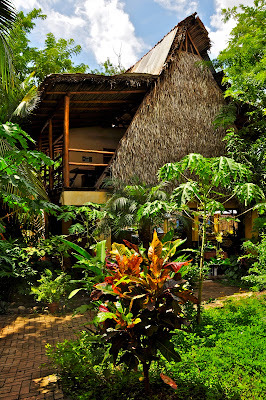 This is another photo of the grounds of the Spanish immersion school in Tamarindo. On the left is a classroom building. I presume that the schools that most people attended did not have so much tropical flora surrounding the classrooms. It looks like a pleasant environment for learning. I usually post photos of people on the beach or otherwise enjoying a vacation in Tamarindo, which is a resort town, after all. But, some people come to Tamarindo to learn. There are Spanish immersion schools in Tamarindo. What better way to learn Spanish than to go to school part of the day and practice your new knowledge of Spanish on the beach after school. This is a photo of part of the beachfront at the Tamarindo Diria Resort. Guests of the hotel or condo units have a choice of spending time on the beach or lounging around overlooking the beach on the grassy lawn, under the shade of palm trees, with access to the food and drink of the resort. This driftwood photo is another candidate that I considered for yesterday's theme of "Decay." We get a lot of driftwood on Playa Langosta because there are so many trees in our area near the beach, and the Langosta estuary is nearby. The estuary is lined with trees, and if one falls into the water, over time it may float out to sea, and then be washed up on the beach. Today is Sunday, so we have new photos posted on our Viva la Voyage travel photo site. This week we are showing photos of the Cathedral of Milan, Italy. Today's world wide Daily Photo Theme is "Decay." For an interpretation of that theme suitable for a Costa Rican beach town's interpretation of that theme, I offer this photo of drift wood. We do have a few older buildings in Tamarindo, but most of the construction is from the last 20 years so there is not a lot of decay. I prefer to show Mother Nature's cycle of decay.